Since last summer I have been working with Juliette designing her fourth book, Lessons in Classical Painting. I believe it will be available in book stores next spring. Her last book Lessons in Classical Drawing is a work of such high caliber that I’ve read it over and over again and the binding is peeling back from the hard cover. If I’m ever asked why this atelier, why this teacher, the answer is quite literally because she wrote the book. Art schools base their drawing curriculum on this book. People apply to the atelier from all over after reading and using this book. It’s that good. The arrival of a follow up painting volume is much anticipated among her readers and I have been equal parts anxious and honored to work on it. On Tuesday I saved the design files for the last time and exported all the chapters for Juliette to send to the publisher. It’s been a great deal of work but also a great experience. I learned a ton about painting and art history while solving design problems with Juliette. Of great inspiration to me was how acutely she examines every detail in her painting curriculum and how carefully she designs the atelier experience. When the book comes out, the chapter on color will blow your mind. The text and layout was due to the publisher on April 1, and in the three months leading up to this date, there were a lot of late nights and early Saturday mornings at the studio. Needless to say, I reserved only enough energy to be an atelier student and book designer and none for blogging. We finished the book on Wednesday morning at her kitchen table. Our spring break started Friday and we had been working unfettered ever since. I’ve been off coffee for months and over the weekend I had three cappuccinos. I was sipping on my third green tea that morning and my hair was piled in a stringy bun on my head, begging to be washed, when I hit ‘send’ on the files. We almost high-fived, but then didn’t — a lot can happen between now and next spring. We’ll high five when the book comes out. The sun was shining and I felt light as air. A big task was completed and spring break awaited. She got out her checkbook to settle up for my time and offered me a trade — part monetary, part art. To be clear, one of her drawings is worth more than the work I did for the book all year, easily. But this month was a killer, y’all. I haven’t seen our savings so depleted in a long time. This sort of thing always happens when you’re low on dough. One time Emmett and I missed out on seeing Cesaria Evora at Carnegie Hall because the tickets were $50 a piece and that was all we had to our names. I remember the night of the show we were in our hot apartment eating ramen knowing we chose wrong. She died four years later, rarely playing in the US again before her death. I wish we had gone broke to see her. So here was Juliette offering half of my bill in cash and half in art. She brought up a few framed drawings from her basement and I immediately recognized a couple of them from books. I sucked in air through my teeth. My ruthless pragmatist wrestled with my que sera sera. Just then Cesaria Evora descended from heaven and placed her hand on my shoulder and made me ask, Do you have any female nudes? Apparently, not only was I taking the art, I was asking my master draughtsman teacher to see more options. 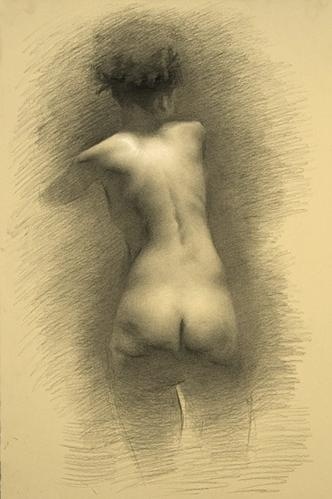 If someday my progeny wonders how we ended up with the breathtaking “Back,” charcoal on paper, 26 x 16.5, a Juliette Aristides original, tell them it was pure hubris. When I woke up Wednesday morning, I did not foresee leaving Juliette’s house later that day, navigating down the steep wooden porch steps, holding a drawing and a check. She knew she was giving me a great drawing for a steal and said she was doing it was because she was grateful. This photo was taken under yellow incandescents and doesn’t do the drawing justice. But here she is with rich shadows, masterful mid-tones, and a careful highlight on her shoulder blade. In your honor, Caesaria, I did the right thing. i love this story. hard work all the way around, equitably rewarded. that drawing is beautiful. It’s fun when the cosmos seems to reach right out and reward you for hard work! I want you come over and see it.